Writers joined artists to collaborate and create a visual artwork and a companion written piece as part of the first-ever artist and writer exhibition, Word Works: Artist and Author Challenge. 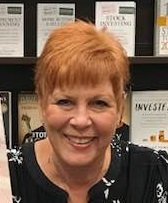 Months earlier, we were randomly paired up with another writer or artist, and some of us didn't meet until the night of the event on August 3, 2018, held at Frame & Things in Cove Terrace Shopping Center. I didn't meet my partner, Raven Garcia, until the night of the event. She is an amazing metal artist! 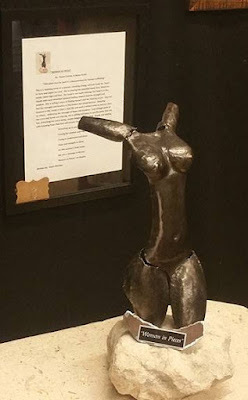 Below is her metal art titled "Women in Pieces" along with the written piece I submitted. This is a stunning torso of a woman, standing strong, tall and ready for “bare,” to bare and repair her soul. She is missing the essential head, face, forearms, hands, lower legs, and feet. Her head is not really missing; her head is in the clouds with neck stretched upward looking toward God for strength and wisdom. She is telling a story of finding herself and her missing pieces. One can feel the strength and bravery in this broken but proud woman. Stepping forward in life, ready to start a new life and walk a million miles to tell her story to others, delivering the message of hope and freedom. Even though parts of her arms and hands are missing, she is willing and open to use the parts that she has, stretching her every being, maybe begging for freedom. Ready and waiting with knowing hope that God will answer her prayers. Praying for wisdom and might. “Women in Pieces” on display.